There are a ton of things we love about this time of year and one of them is that everything seems to have a pastel color scheme. Easter Bark is a candy-centric recipe that looks pretty but is so easy to make, anyone can do it! We scooped up some of our favorite chocolate eggs from Oriental Trading and added in vanilla Oreos (we can never resist!). Done in under and hour, this is the perfect recipe to make with little babes — Zelda loves overseeing sprinkle placement. What sweets does your crew make for Easter? Tell me in the comments below. 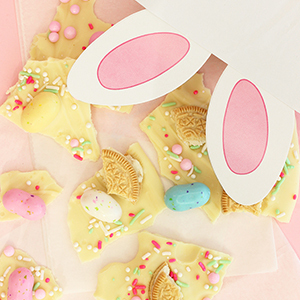 Easter Bark is a candy-centric recipe that looks pretty but is so easy to make, anyone can do it! Chop the white baker's chocolate and place into a bowl with the Crisco shortening. Microwave on high for 30 seconds, stir and then microwave for another 30 seconds. Stir to combine. Pour onto a piece of parchment paper and top with Oreos, Mighty Malts speckled eggs and Easter sprinkles. Place in the fridge for 30-60 minutes; remove and break into pieces. Give to your littles on Easter!